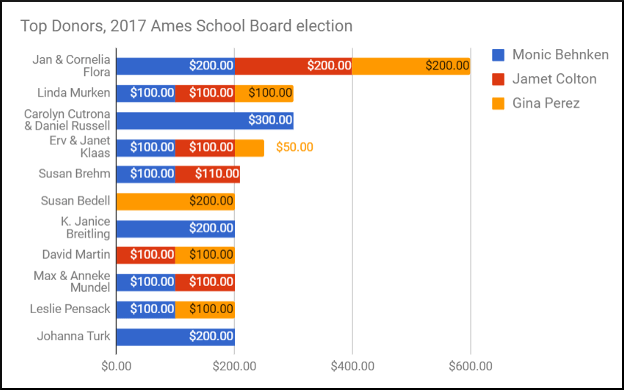 Update, 9/12: According to initial results (PDF), with a turnout of just over 8.5 percent, challengers Monic Behnken, Jamet Colton, and Gina Perez have all won seats on the Ames School Board, knocking off incumbent Tim Rasmussen, who finished fourth in the race to fill the board’s three seats up for grabs. 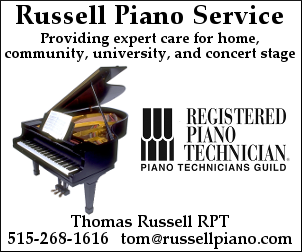 Original post: On Tuesday, from 7 a.m. to 8 p.m., voters living within the Ames Community School District’s boundaries can go to the polls to select up to three of the four candidates on the ballot (PDF) whom they’d like to see on the seven-member school board — one incumbent, former elementary school teacher Tim Rasmussen; and three challengers, all of them women: Iowa State University sociology professor Monic Behnken, elementary education assistant Jamet Colton, and Iowa Department of Transportation IT employee Gina Perez. Progressive issues, too, have taken center stage in the election, including how to better address racial disparities in student achievement (which, although above the state average, has been a contentious issue for years in Ames); improve protections against bullying for LGBT students; ensure the safety of immigrants in the district, particularly now with President Trump’s ongoing efforts to aggressively crack down on undocumented immigrants; and fight for better teacher pay after GOP state lawmakers gutted collective bargaining rights this spring. Critics of the current board have also protested a school lunch policy adopted in June and supported by Rasmussen (because of a federal funding deadline) that they say risks embarrassing poorer students, and taken aim at a controversial new literacy pilot program whose curriculum standards have been challenged. The lack of diversity on the school board itself has also been an issue. If Behnken, Colton, and Perez are all elected, the Ames Tribune noted, the board would transition from having just one woman on it to a female majority. It would also become significantly more ethnically diverse: Behnken is African American; Colton grew up in Santiago, Chile, under Pinochet; and Perez has spoken about her multicultural children. Top donors to the campaigns of the three women include retired ISU sociology professors and local activists Jan and Cornelia Flora; former county Board of Supervisors candidate and Bakken pipeline foe Linda Murken; ISU psychologists Carolyn Cutrona and Daniel Russell, who have researched the impact of economic hardship on children; local environmentalist Erv Klaas and his wife Janet; Everytown for Gun Safety organizer Susan Brehm; progressive Ames council candidate David Martin; and Anneke Mundel, a member of the Ames Human Relations Commission. Several other local progressives are top donors to the three campaigns but gave less than $200, as of Sept. 1. 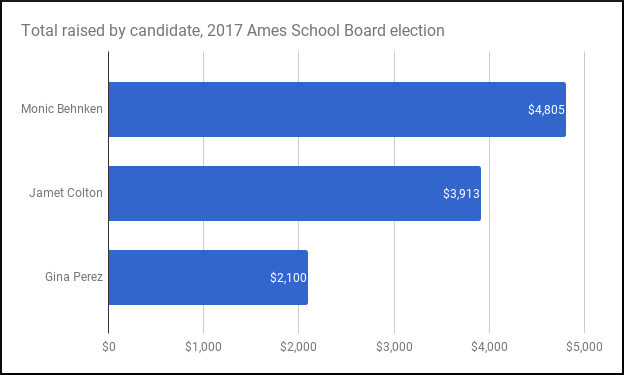 Among them are Lewis Rosser, a school board member who gave $45 to Behnken, $50 to Colton, and $100 to Perez; embattled Story County Supervisor Lauris Olson, who gave $50 to each campaign; Ames mayoral candidate Victoria Szopinski, who gave $100 to Colton and $50 to Perez; local gun control advocate Jess Calhoun, who gave $140 to Colton; state Sen. Herman Quirmbach and his partner Leigh Tesfatsion, who gave $50 to Behnken and $100 to Perez; and former council member Matthew Goodman, a founding member of the Ames Progressive Alliance, a recently formed organization that hosted a school board candidates forum last week, and his wife Neysa, who gave $100 to Behnken and $40 to Colton. Turnout for local school board elections is typically abysmal — in 2015, less than 6 percent of eligible voters showed up at the polls. That could improve on Tuesday, given the attention the election has received, beyond the current district controversies, talk of building a new high school, and long-stalled plans for a new pool. In June, Behnken was featured in a Politico article about the challenges women candidates across the country face. Early last month, Perez, a Bernie Sanders supporter in 2016, was endorsed by his campaign spinoff organization Our Revolution. And last week, Behnken’s campaign made headlines again, darker this time, after one of its yard signs was defaced by white supremacist propaganda. In addition to Rasmussen’s seat, two of the candidates will fill positions currently held by Story Construction president Mike Espeset and attorney Bill Talbot, who both chose not to run for re-election.